Heading south from Rossland, B.C., the road descends steadily toward the U.S. border until a single track angles off like a runaway truck lane. Al Eagleton’s driveway leads to his two-storey workshop and world headquarters of Instinct Killer Ski Corp., one of a growing number of independent ski brands in Western Canada. Eagleton’s 12-hectare patch of mountainside is home to most of the aspen trees that he fells, mills and laminates to form the wood cores of his handmade skis. 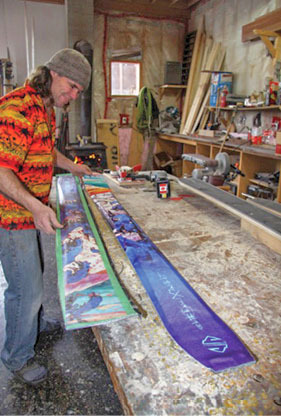 Eagleton, a carpenter and woodworker by training, says this approach means he can make sure each pair’s left and right skis have mirror-matching wood grains. Eventually that core is sandwiched by a carbon-graphite P-tex base and seven layers of composite weaves, but, for Eagleton, the wood remains central. “The carbon gives it spring, but the wood gives it soul,” says Eagleton. And two of his five models are available with a distinctive topsheet sporting limited-run graphics from local painter Stéphanie Gauvin. Eagleton says he sells upwards of a hundred pairs of skis a year, many of which are found in lift lines at nearby Red and Whitewater resorts. In an industry long dominated by international giants, these skis, with their home-grown core, are very much of the Kootenays.